Apples! Every fall I enjoy seeing the apples on the trees and making applesauce. My oldest in particular loves applesauce. I usually can it by the quart. It smells wonderful as it is cooking down. 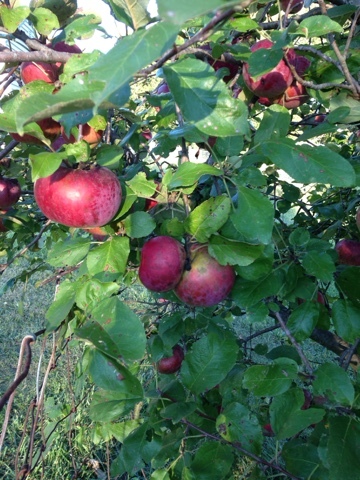 This year our, still fairly young trees, were laden with apples. We ate several, I fed some to the animals and I tried a few other recipes. One recipe was a football game snack. 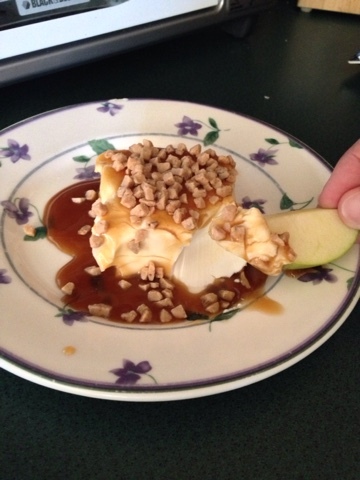 Ingredients: Cream cheese, caramel sauce and toffee bits. I found the toffee bits in the baking isle of the local grocery store. I think any nuts would work if there were not any allergies to contend with. It is made just as it looks. I cut a couple apples into wedges (you could mix them with a little lemon juice to help prevent browning) and started dipping. Yummy treat and very fast.